After losing Fort Sumter to Confederate forces the North clamored to get even. The people thirsted for the Union to attack the new Confederate capital of Richmond, Virginia and put an early end to the war. Recruitment of soldiers was fervent as both sides did their best to recruit as many volunteers as possible. As a result of what the South believed was an impending attack, the Confederate leaders put Brigadier General Joseph E. Johnson in charge of the troops around Harper’s Ferry in West Virginia. Simultaneously, they placed Johnson's second in command Brigadier General Pierre Beauregard in charge of defending the rail center in Manassas, Virginia, near Washington D.C. Beauregard was told to prepare his defenses along Bull Run Creek. By July of 1861, thousands of inexperienced Union troops were massed outside of Washington D.C. ready for action. Both sides were convinced that the war would be short. At the same time, President Lincoln was facing pressure to begin an offensive. Then on July 18, Lincoln ordered the Union Army to march toward Manassas. In command of the army of 35,000 men was General Irwin McDowell. Accompanying them was a crowd of curious onlookers on horseback and in carriages who believed what they were about to see was some kind of sporting event. Many bought picnic lunches in hopes of watching the battle from the surrounding hillsides. General McDowell's inexperienced troops retreated all the way to Washington D.C. The roads were glutted with the spectators who were fleeing for their lives. At the same time, Officers lost control of their troops as they fled. Union general William Franklin blamed the loss on inferior muskets. However, both sides were inexperienced and poorly trained including the commanding officers. Numerous officers froze in the face of the horrors of the battlefield. These officers were unable to command their troops and gave few orders to men who were waiting for them. Luckily for the Union forces the Confederates did not follow their retreat into Washington D.C because they may have taken the capital. It was the Confederates’ lack of supplies and leadership that prevented the attack. 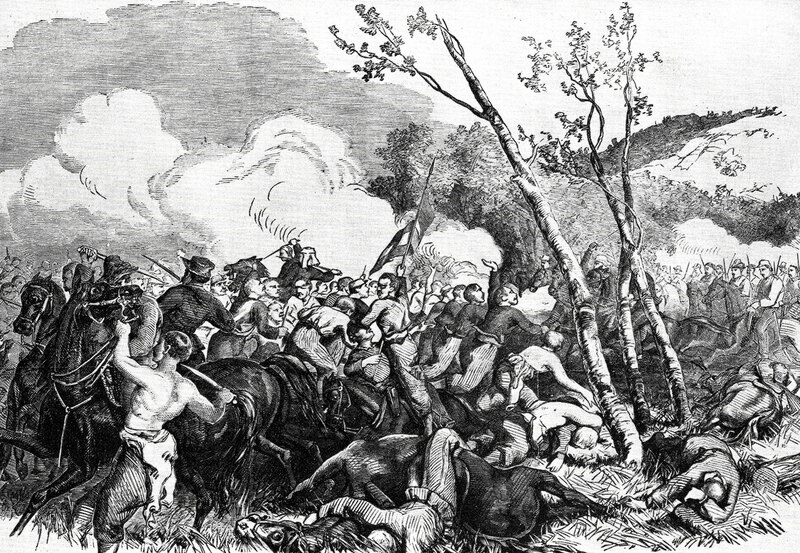 By the end of the battle the Union suffered 418 deaths, and another 2,300 wounded or captured. At the same time, 387 Confederate soldiers died, and another 1,600 wounded or captured. At the conclusion of the battle both sides realized that it was not going to be a short war and they began recruiting the men and supplies that would be needed for a long drawn out conflict. The First Battle of Bull Run ranks as the 4th most important battle fought during the Civil War. It was important because it showed both sides what it would take to be victorious.